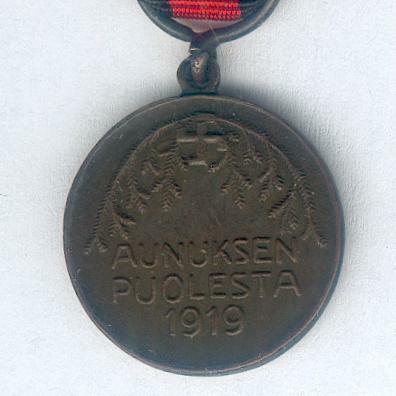 Miniature circular bronze medal with eyelet for ribbon suspension; the face with the vertical representation of a river, crossed sword and sabre imposed, within a ring inscribed ‘EI SANOIN MUTTA TEOIN’ (Not in Words but in Deeds); the reverse inscribed ‘AUNUKSEN / PUOLESTA / 1919’ (For Aunis 1919) below a cross gammée and spray of spruce; diameter 16.91mm (0.67 inch); on probably original correct ribbon. 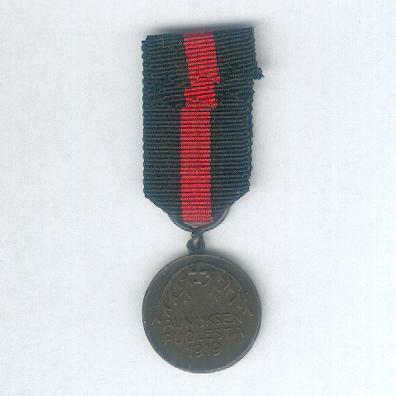 The Medal was instituted in 1923 and awarded to participants in the campaign in Aunis during the Wars of Kindred Nations against Soviet Russia. The intervention of Finnish volunteers against Red forces in Estonia was crucial in her gaining independence but, despite the upheavals of the Russian revolutions and civil war, there was never any real chance of the other areas to the east or south of Finland such as Aunis becoming independent of Russia. 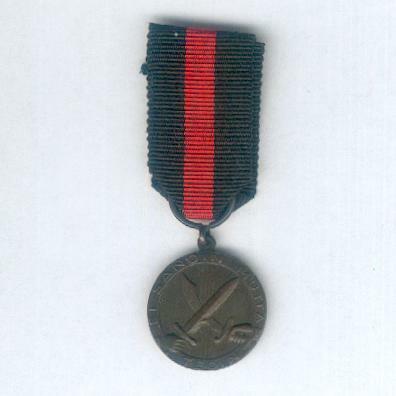 The number of White Finnish volunteers involved was small and just 3,500 full-size medals were manufactured; the miniature is found less often.